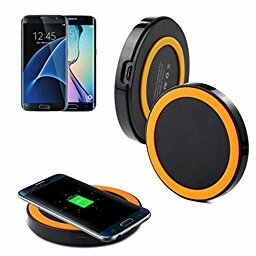 Most wireless chargers use magnetic induction and magnetic resonance. They offer to place the gadget on a special surface for automatic charging, without the need to connect the cable to the device. Of course, wireless charging is not really wireless. Your phone, a smart clock, a tablet do not need to be connected to the charging, but the wireless charger itself must still be connected with a cable to the power adapter or USB port. When Apple introduced the iPhone 5 without the support of wireless charging, at the same time in smartphones on competing platforms Android and Windows, the modules were built in many flagship models. Five years later, Apple changed its mind. With the iPhone 8, iPhone 8 Plus and the iPhone X, Apple includes support for wireless charging using the open Qi standard (pronounced "shi", as this is a Chinese word that refers to "life energy" in living things.). While the radius of operation of the Qi standard was originally limited to a small range of magnetic field, it now also supports the use of the phenomenon of magnetic resonance. It works the same way, but the charging gadget can be located up to 45 mm from the surface of the wireless charger, and not touch it, as it was before. This method is less efficient than the method based on magnetic induction, but there are some advantages - for example, a wireless charger can be installed under the surface of the table, and you can place the gadget with the receiver on the table to charge it. It also allows you to place several devices on one charging platform and each of them will be charged in parallel. A little about the energy consumption of the system. When charging gadgets is not performed, the Qi charger does not consume large amounts of electricity. A special module with low power consumption monitors this moment and cuts off the current supply to the coil, but when it detects that the gadget that needs charging is placed on the charger site, it increases the output power of the magnetic field. Wireless charging is becoming more common and more carefully standardized. And this time Apple did not create its own wireless standard. Instead, he decided to support the existing Qi standard, which also supports many third-party devices. However, the Qi operated by the Wireless Power consortium is the most common at the moment, but it is not alone. In second place - Power Matters Alliance, or the PMA standard. He uses magnetic induction, like Qi. However, these two standards are incompatible. New iPhones and other Apple products can not be recharged with the PMA wireless charger. But some devices on the market are compatible with both standards. Modern Samsung smartphones, such as Galaxy Note8, Galaxy S8 and Galaxy S7, in fact, support both Qi and PMA, so they can be charged from any chargers. Starbucks (the world cafe network) made a bet on PMA before, but now there is an option that it can rethink the situation, since the iPhone supports only Qi. There is also a third competitor in the Qi standard. This is Alliance for Wireless Power (A4WP), which uses the technology of Rezence. The essence of the principle of the standard - in the use of the effect of magnetic resonance, which will expand the charging area for several devices. You can place several gadgets on one charger, move them and even charge them through an object, such as a book. To work with Rezence technology, you need a Bluetooth connection to the device. Realizing that the Qi standard is the most popular on the market, competitors decided to unite. So there was a new formation of the AirFuel Alliance, which since 2015 has been promoting its wireless charging technologies. The consortium included 195 companies. The most interesting thing is that the AirFuel Alliance enlisted the support of Intel, which indicates that everything is serious and for a long time. Well, competition is always good for users, because it is the engine of progress.